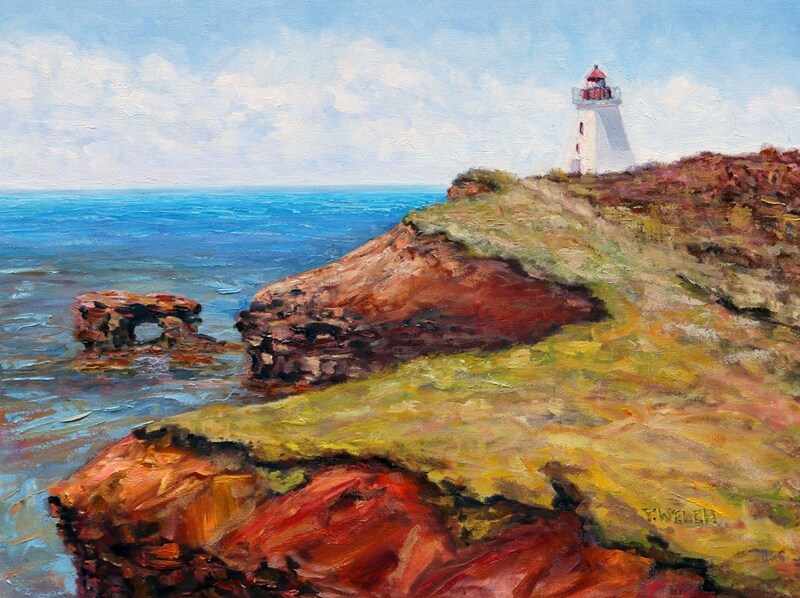 The West Point Lighthouse Prince Edward Island, 30 x 24 inch oil painting, is now finished. 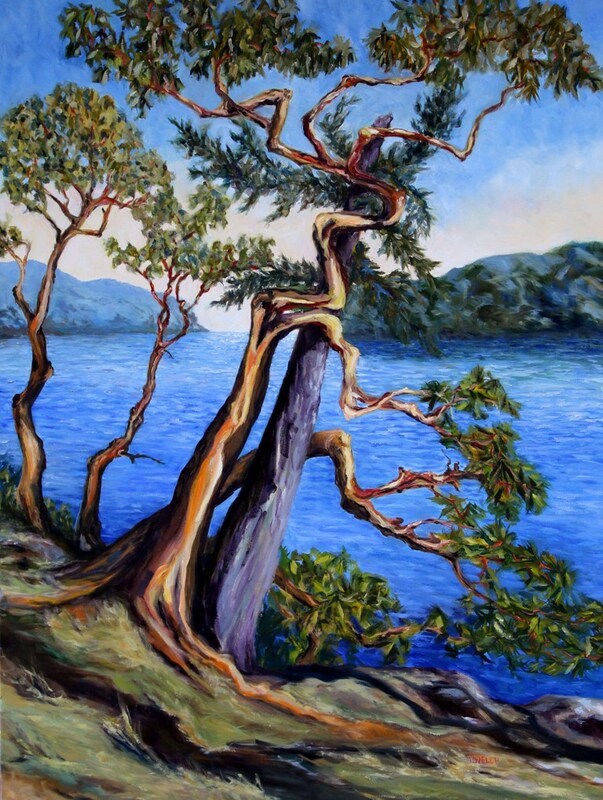 The Storytelling Arbutus Tree Mayne Island BC, 60 x 40 oil painting, is now finished. A painting sketch was sold immediately picked up for delivery. The grounds have been painted on four blank canvases. 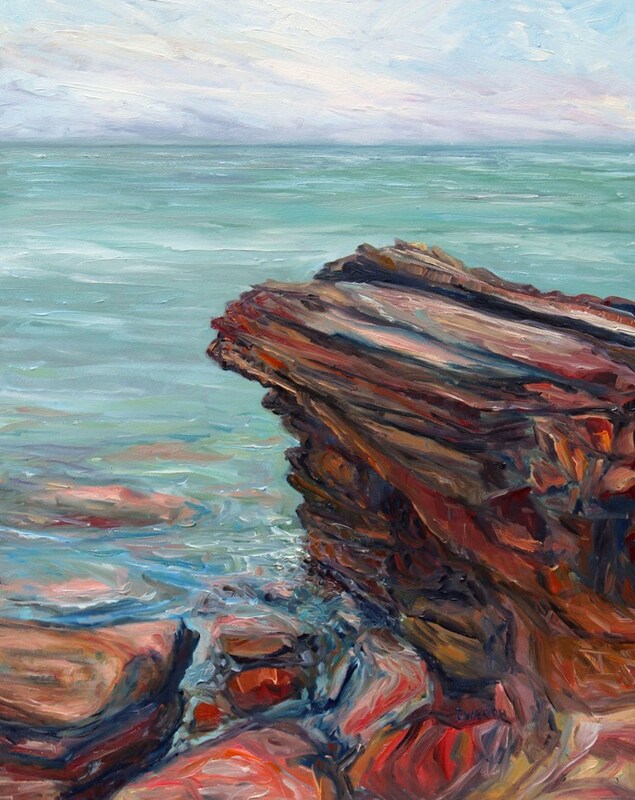 And the edges have been painted on three medium size landscape and seascape paintings. This is enough for one week don’t you think? So do you want to skip out and come with me to the gather reference material by the sea? It is sunny. We should have the shores to ourselves, along with the birds of course. Yes? Okay! Off we go for a wee short break. Don’t forget your sunglasses and windbreaker. I suppose, I might as well show you to the latest two completed paintings while you are here. Yes, if you remember from previous posts, this is a good-sized painting and will need a good-sized wall. I will get them up in the online gallery soon and let you know over on the website at TerrillWelchArtist.com. 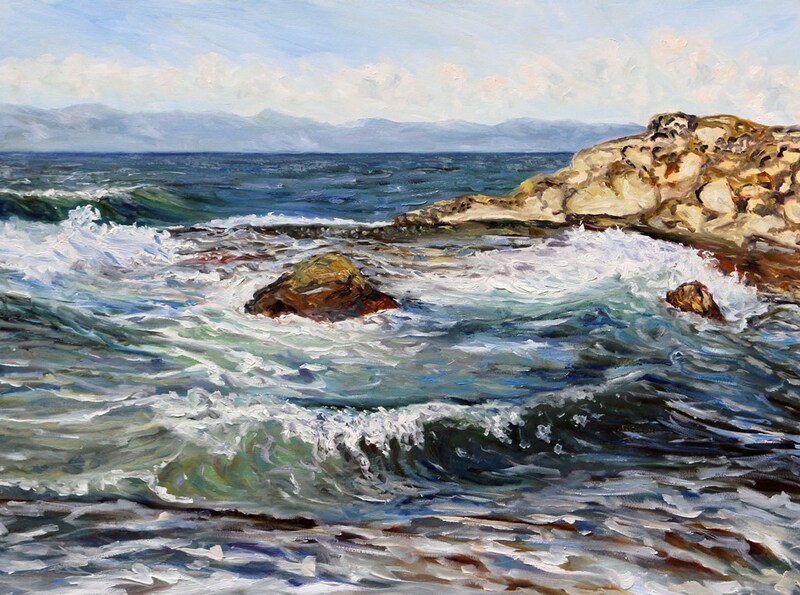 But today is a town day to get Seaside Mayne Island, the large 60 x 36 landscape painting, framed for the collector before I deliver the painting sometime in April. I will need to pick up more canvases and sleeves for the latest batch of greeting cards too. Then when I get back there are local group shows to submit work to and planning for the booth at Art! Vancouver Fair in late May where I accepted a request to be the lead artist showing in the Artists In Canada booth. 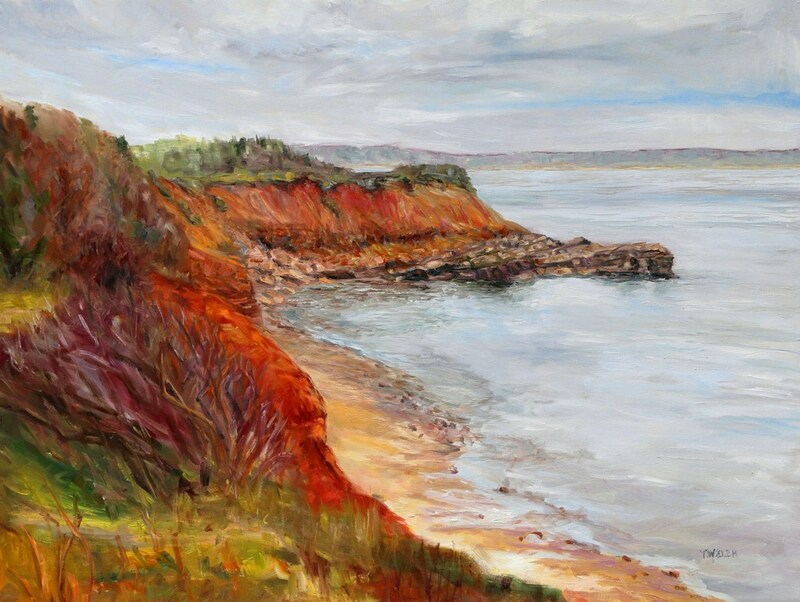 Nothing too unusual really, just the rhythm of a landscape painter’s ordinary everyday life on a small island off the southwest coast of Canada. What is the rhythm of your ordinary everyday life these days? Wow! You’ve had a busy week. No wonder you need to pause. I loved the mini video vacation. Very refreshing. And inspiring. i love the moss-covered rocks with the breakers behind. So many frames in that video seem perfect for painting. It’s no wonder you never run out of subject matter, living where you do. The painting of the arbutus is my favorite. Something about trees and their graceful branches and shadows, and yes, the stories they seem to tell so grandly and silently there by the wayside. So lovely. Thank you Deborah and I agree there is something about trees! 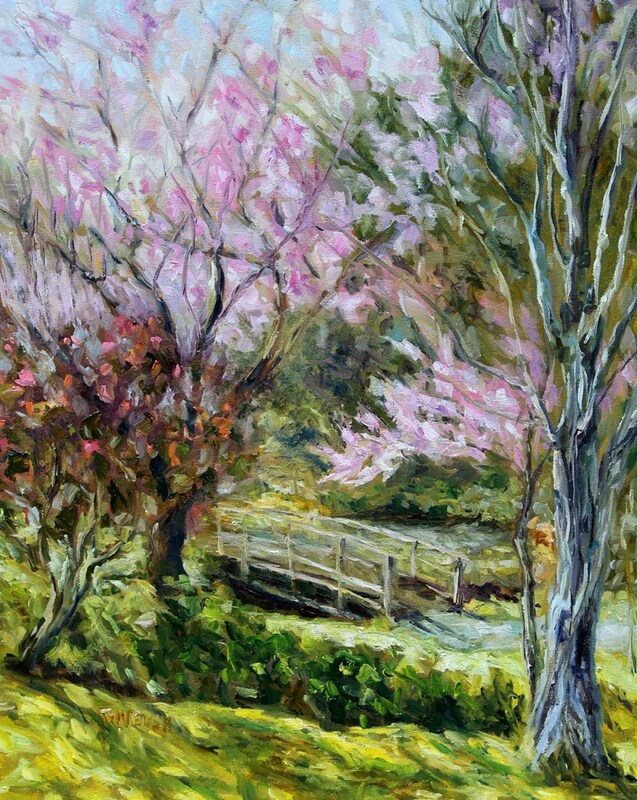 🙂 We will have lived on Mayne Island for 10 years in May and I still have many, many paintings I would like to do. No two days are ever the same and I like it that way. It is great to see and feel all of your productivity, creativity seems to just flow from you. 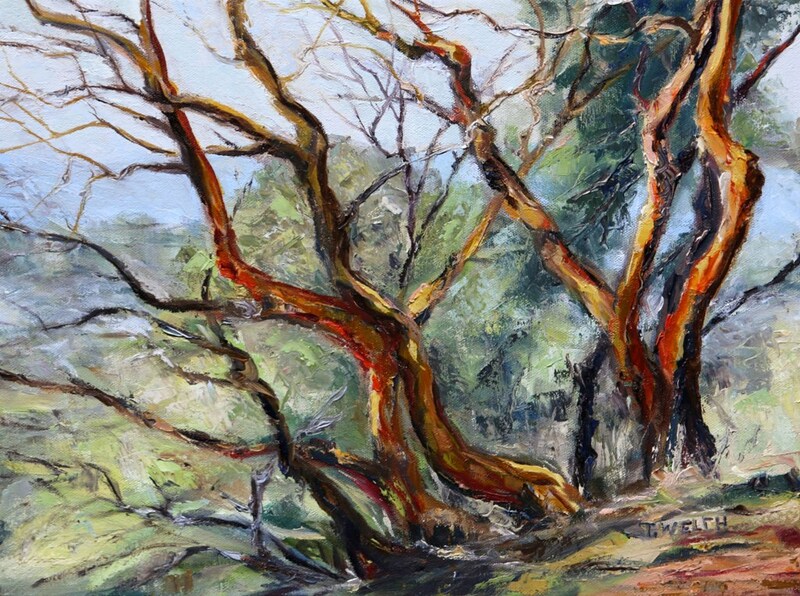 Love the Arbutus tree, as of late I have been trying to walk along the other side of the lake where the trees envelope the path where I have a sense of being in the wood rather then just walking by it. So glad you are getting time in the woods Jeff! 🙂 Important time to have but I don’t need to mention this to you of course. Take good care Jeff! Terrill — I’m so glad I grabbed my sunglasses and jacket for that lovely jaunt! Thank you for the seaside stroll!